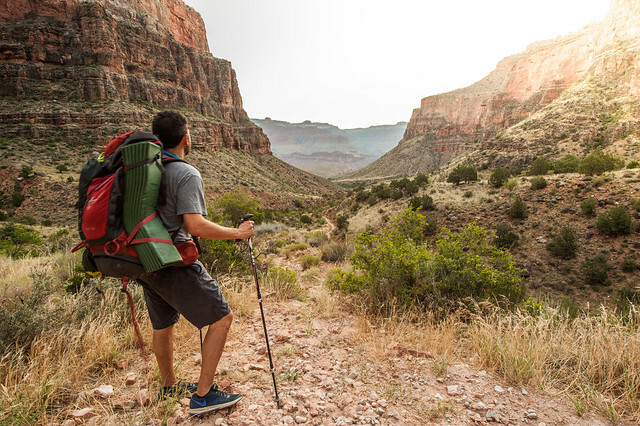 I don’t recall the exact moment when I decided my first backpacking trip would be a hike to the bottom of the Grand Canyon, or that it would be in the peak of summer, by myself. 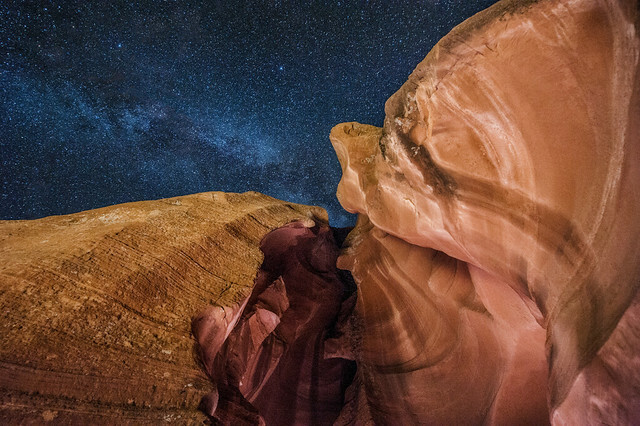 I didn’t even know that camping in the valley of the Grand Canyon was a thing until I started planning an Arizona photography trip in May. It was then that my wife booked a bachelorette party vacation to Scottsdale, and I decided to tag along (Southwest Companion Pass FTW). While the risks of hiking the Grand Canyon are many, particularly in the middle of summer, I felt that I was in pretty good shape, having kept up with my running routine, and given the heavy volume of tourists that frequent this Natural World Wonder, I figured that, worst case scenario, I suffer the minor embarrassment of requiring an air-lift rescue by the Grand Canyon rangers. 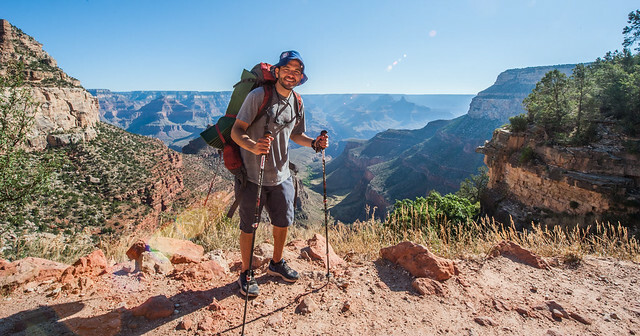 The first step for anyone interested in overnight backpacking the Grand Canyon is to apply for a permit with the National Park Service. While they suggest applying four months prior to your scheduled trip, I was able to secure my permit for a July 20th start date after applying in early June. 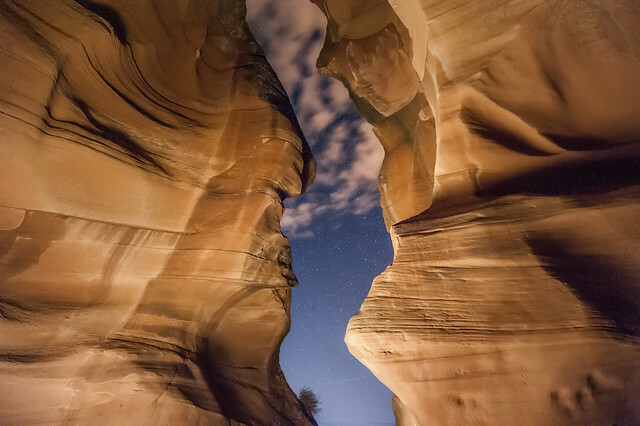 The permit application requires a detailed itinerary, including trail names and campsites. 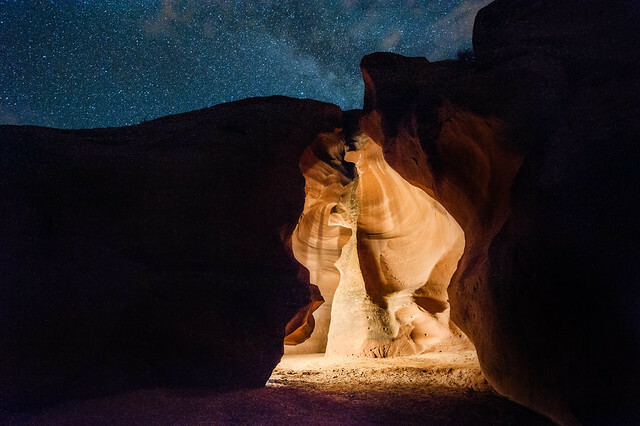 Knowing very little about the options, I essentially copied my itinerary from what was labeled as an “intermediate” two-day hike offered by a guided tour company’s website. I rented the necessary backpacking gear from an outdoors store in Flagstaff, brought along some food, my Kindle, and my very heavy camera rig (Nikon D700, 14-24mm lens, tripod). Knowing that every ounce counts on a hike, I put together an itemized spreadsheet before leaving to give me a general idea of how heavy my pack would be. I made what I thought were relatively conservative estimates, given that I didn’t know how heavy the rental equipment would be. My estimate came to 32.7lbs, assuming that all five liters of my bladder and water bottles were filled to the max. Prior to leaving for Arizona, I did a practice hike, filling my own backpack up to about 30lbs. I was as ready as I was going to be. When the day finally came, I was admittedly nervous. The NPS site urges summer hikers not to hike between 10:00 a.m. and 4:00 p.m. Unable to pick up my equipment from the rental shop until 8am, followed by a two hour drive to the canyon, I would be starting my hike at the worst time of day possible. Furthermore, while the canyon temperature was only in the upper 80s at the rim, the temperatures increase as you descend (think snow capped mountains). While the drive to the national park went without incident, it took about a half hour to finally settle on a parking spot, further than expected from the trailhead. My heart was racing as I meticulously filled my pack, checking off every item as I went. When I finally had everything packed, I did a quick scale test to make sure I wasn’t carrying too much weight. 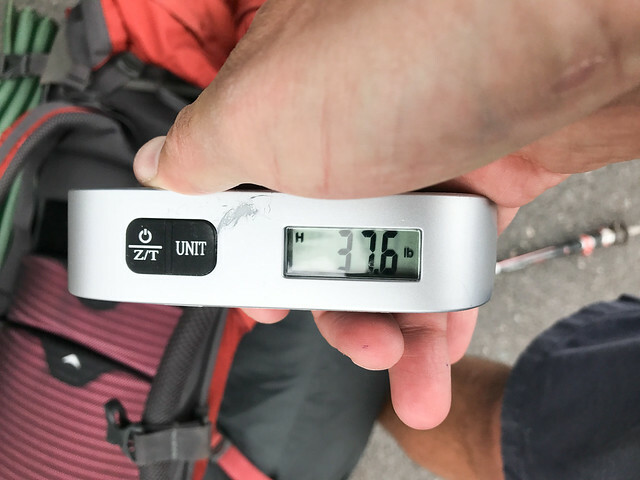 My pack weighed in a good 5lbs heavier than I expected. The thought of leaving my camera behind to reduce weight crossed my mind, but that wasn’t the plan. I did everything I could to keep my load light, including sawing off half the handle of my toothbrush. The pack was as light as it was going to be, and it was time to leave. I approached the trailhead with my huge pack and noticed many stares from nearby tourists. The trail is not exclusive to permitted backpackers, and nearly every single person that I saw at the trailhead would turn around before making it even a mile down the trail. I wondered if leaving for the campsites this late was unheard of. Nonetheless, I continued on. Getting ready to begin my descent down the Bright Angel Trailhead. 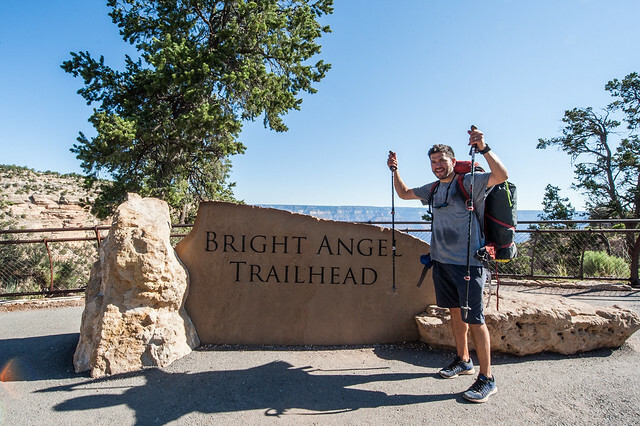 “The journey of a thousand miles starts with one step,” I thought, as I made my first step on the Bright Angel Trail towards the Grand Canyon’s valley. Steps two, three, and four would carry that same enthusiasm, but on step five, as I heard a loud “SNAP,” my excitement quickly dissipated. The snapping noise was the sound of my hiking pole splitting in half. I did a quick assessment of the situation and found that one of the plastic clamps that holds the adjustable legs in place was partially broken. Extremely frustrated, I sat with the pole for 15 minutes as about 1,000 tourists walked by judging my pathetic attempts to reconnect the pole pieces. By some miracle, I was able to tighten the clamp and get the pole to hold in place, and once again, I began my journey along the early switchbacks of Bright Angel. As I carefully made my descent, I put as much weight as possible on my hiking poles in order to both test that they were in good working order and save my joints. I was now moving, and the early jitters that initially plagued my mind started to vanish. Replacing this anxiety was pure awe and admiration for views of the most breathtaking landscapes that I have ever seen. 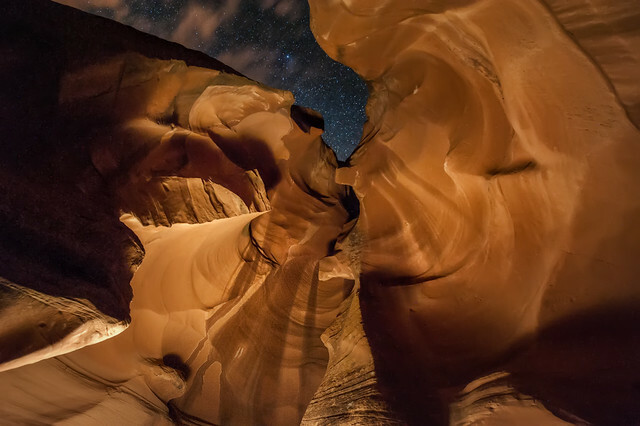 When visiting new places, it is always a challenge to balance the time you spend taking in and appreciating the beauty of your surroundings with the act of capturing them on camera. 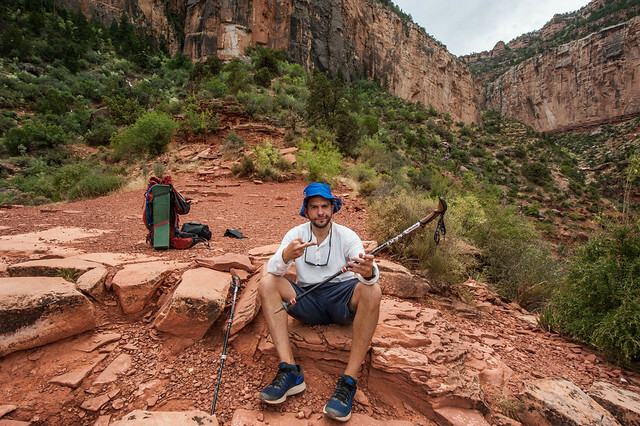 The Grand Canyon was no different, except that stopping to set up my camera also served as a vital break from the heat and hard work of descending down the steepest parts of the trail. The hiking poles, which had served their purpose so well up until this point, had once again let me down. With the same clamp that had set me back earlier again losing hold of the smaller extension, three options crossed my mind, 1) I could return the pole to the car and start my hike over with a single hiking pole, 2) I could put the pole in my bag and continue my hike with a single pole, or 3) I could accept the message from the hiking gods that this wasn’t meant to be and call off the hike. Once again, I put my bag down and inspected the damage. Despite the fact that one of the three protruding plastic indentations of the top clamp had clearly broken off, the clamp appeared functional, I just needed to wrap it around the other end of the pole, though this appeared to be an an impossible task. After about 20 minutes of wrestling the pole, I realized that by completely separating the two pieces, I was able to get the clamp around the bottom piece, slide it to a tight position, and close the clamp. I did a quick load test, and the pole seemed to be functional once more. I was back in business, hooray! As I weaved my way down the trail, the mental tension dissipated, and I could once again absorb the stunning beauty of the scenery. I stopped at both the mile and a half and three mile rest houses to refill my water supply. My first of many pee breaks came at the three mile resthouse, which included a small uphill hike to the restroom. From just this short hike, I noticed that my breathing had become much heavier, and the weight of my bag suddenly felt burdensome as I struggled up the stairs to the facility. Up until this point, I had successfully kept my mind free from thoughts of covering this same elevation change, only going up, the next day. A view back at the several miles and thousands of feet up to the rim of the canyon. The rest of the hike to my campsite at the Indian Gardens flew by as my own perception of my hiking abilities went from noob to grand master seemingly instantaneously. 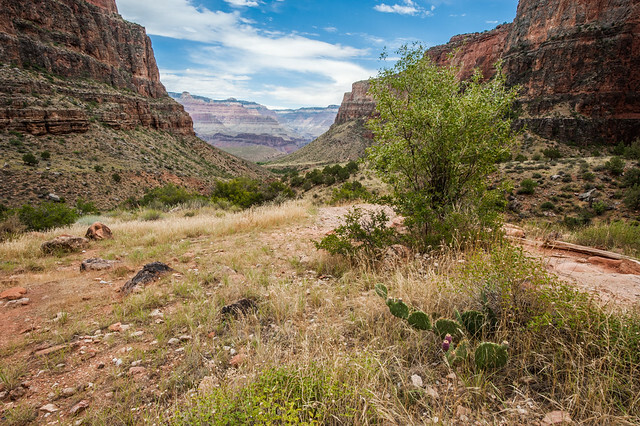 The Indian Gardens is a lush, green, more or less flat area 4.5 miles and 3,000 feet below the canyon’s rim. The first signs of vibrant life at the Indian Garden. There are 15 campsites at the Indian Garden, and most were taken by the time I arrived. 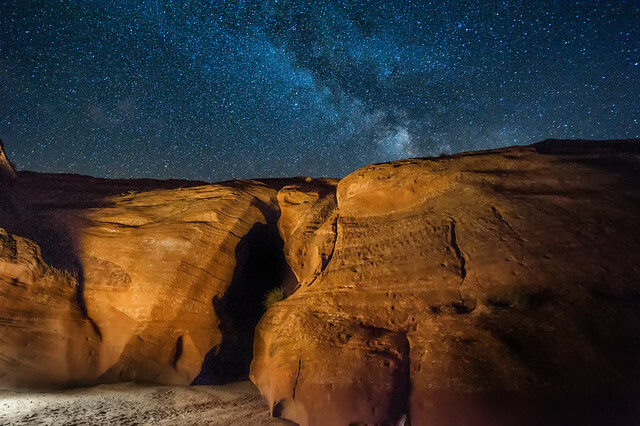 I made several laps from end to end of the campsite, considering which site would give me the best opportunity for photographing the night sky. I finally settled on a campsite at the south end of the garden, adjacent to the trail, thinking that I could stealthily get on the trail for some photos and back to my tent without disturbing nearby campers. Excited to make my first camping meal, dehydrated Louisiana red beans and rice, I lit my stove, only to find I had no pot to boil water in. Already frustrated at having rented a busted hiking pole, the realization that I had received a stove without a pot greatly added to my disappointment in the rental company. 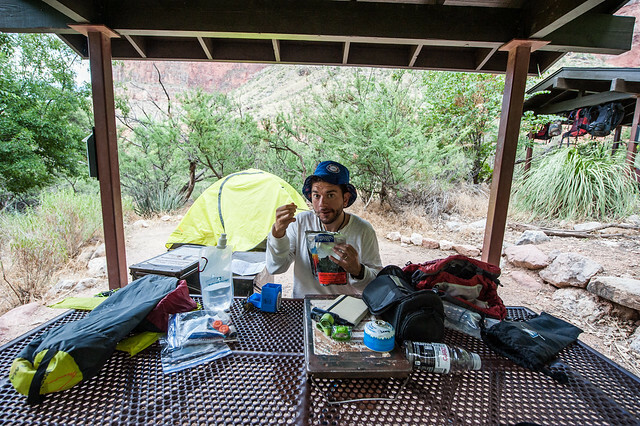 Thankfully, I was able to borrow a pot from some nearby campers and devour my rice and beans as I sadly accepted that I wouldn’t be enjoying any of my instant coffee on this hike. Eating some beans and rice at my campsite at Indian Garden. 4/10 would not recommend this meal. I arrived at the campsite around 2:30 p.m., and after eating and setting up the tent, I had a few hours to spare before considering any more hiking. 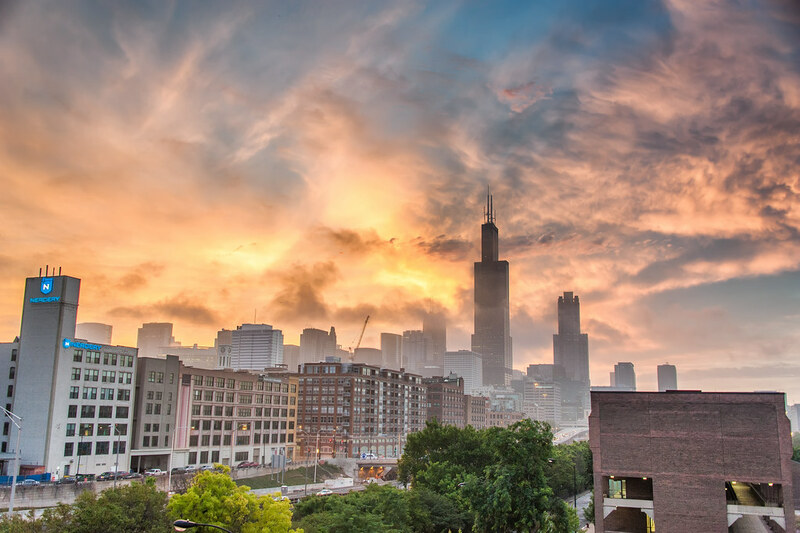 With my legs literally shaking from the use of muscles that I rarely ever use in getting around Chicago and the extreme heat permeating the valley at this time of day, I decided a nap would serve me well. My attempt at sleep, however, was fruitless, and so I settled on reading from my Kindle. Poison Study, by Maria Snyder, did a decent job of keeping my mind off of the fact that I would soon be putting my body through even more pain once the heat subsided some. The Bright Angel Trail forks near the Indian Garden, and I had the option of a mile and a half hike to Plateau Point, considered perhaps the best place to observe 360 degree views of the canyon, or an additional three mile hike to the Colorado River, which would give me the satisfaction of having reached the very bottom of the Grand Canyon. Hot and exhausted from my journey so far, I opted for the easier hike with the views, telling myself that I would save the Colorado River hike for a later visit to Arizona. The hike to Plateau Point was mostly flat, and on the way, I met up with a guided tour that included a couple of visitors also from Chicago. I took this opportunity to chat up the tour guide and ask whether this being his job in any way detracted from the enjoyment of exploring such an amazing area, to which he answered emphatically, “Hell no.” The guide also suggested that I leave camp with them around 3:30 the next morning, having noticed that I was staying at the adjacent campsite and mentioning that I would likely be awoken by their group packing up anyway. 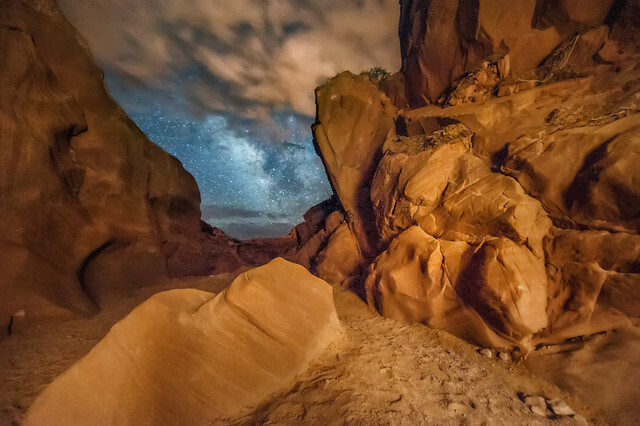 When we arrived at Plateau Point, I knew immediately that I had made the right decision. These views did not disappoint. 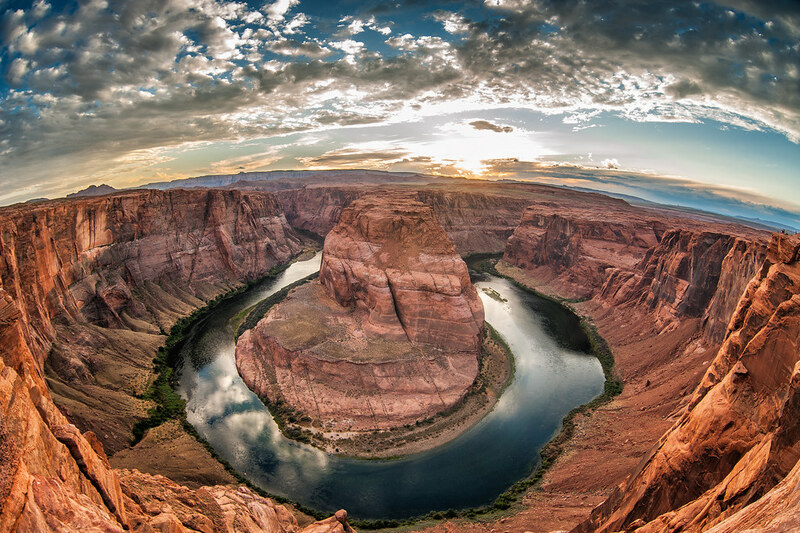 A selfie from a rock overlooking the Colorado River from Plateau Point. 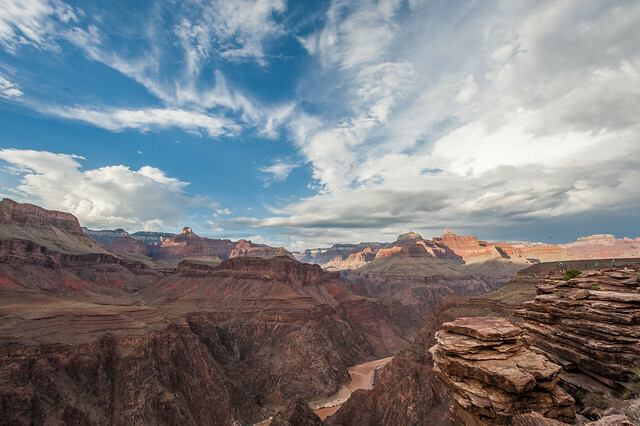 A south facing view of the Grand Canyon from Plateau Point. 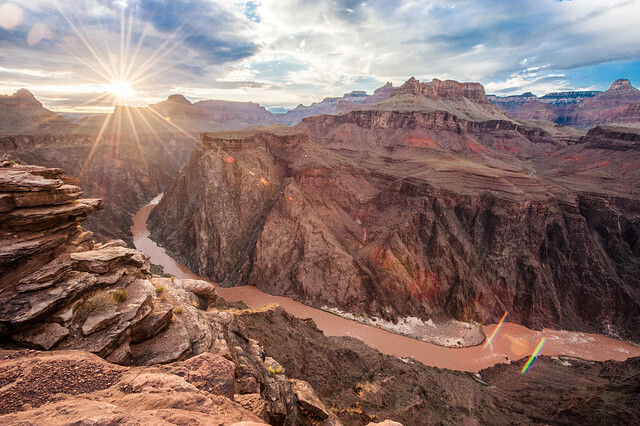 The Colorado River from Plateau Point. We stayed long enough to watch the sun go down before turning around and heading back to camp. 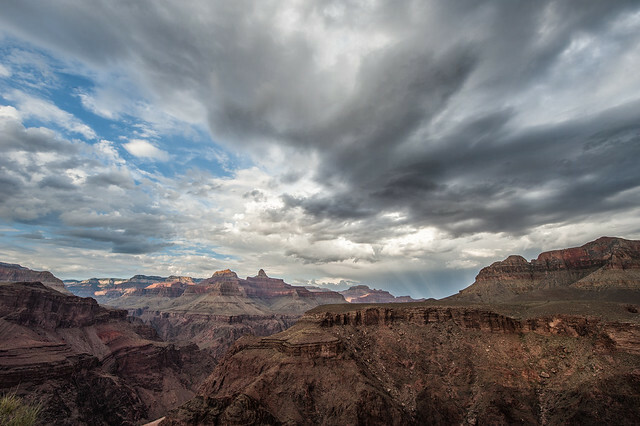 A storm taking shape North of our viewing point from Plateau Point. 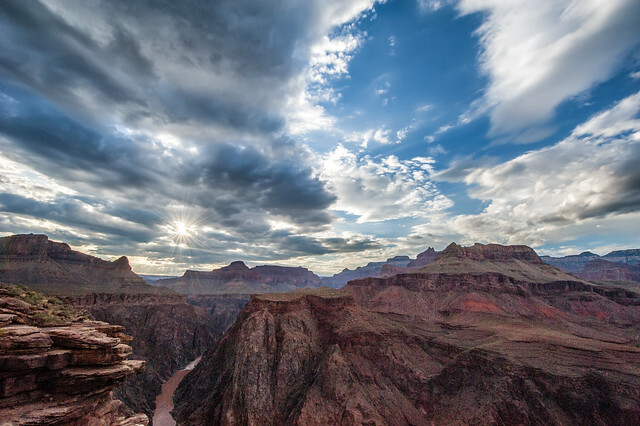 Watching the sunset from Plateau Point. 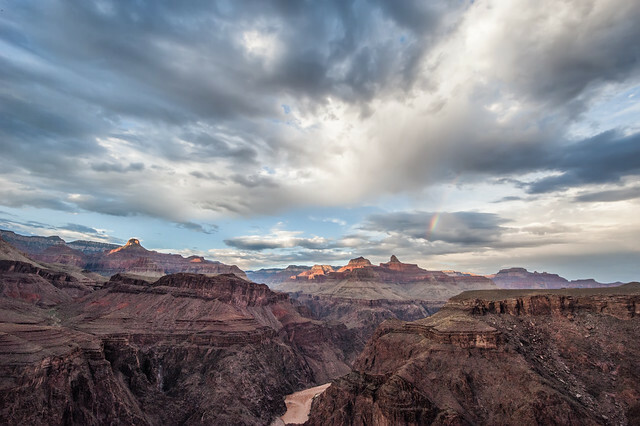 Amazing clouds and a rainbow facing North from Plateau Point. We arrived back at camp around hiker midnight (9:00 p.m.), and I snapped a couple more photos before turning in. 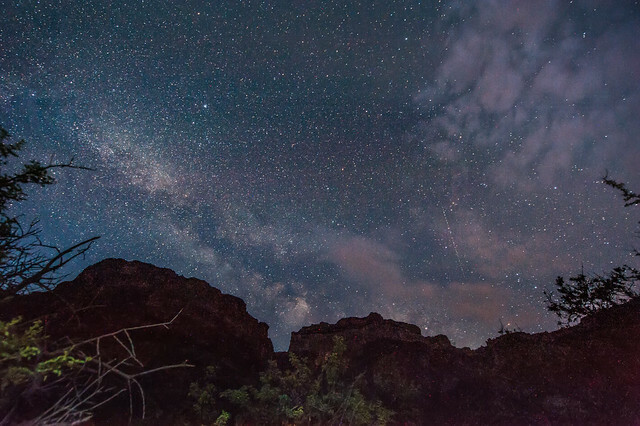 A view of the Milky Way from Bright Angel Trail at Indian Garden. 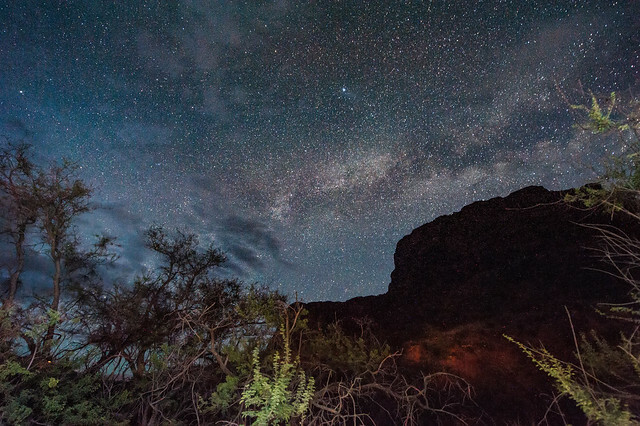 Enjoying the stars at my campsite at Indian Garden. The beauty of waking up at 3:30 a.m. meant that after packing up and heading out, the light of sunrise distracted me from the task of lugging my 38lb bag up the incredibly steep grade of the trail. 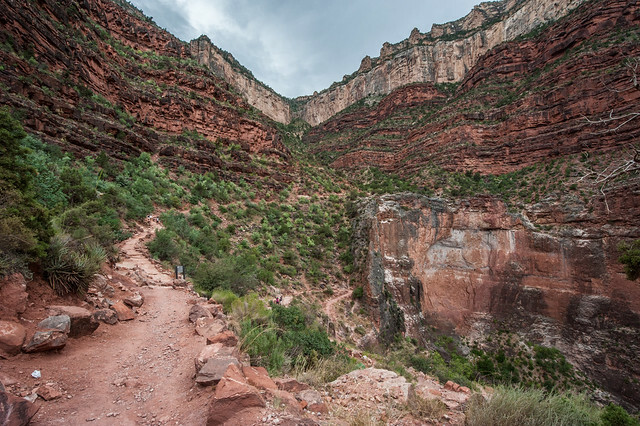 About a half mile into the ascent up the Bright Angel Trail. 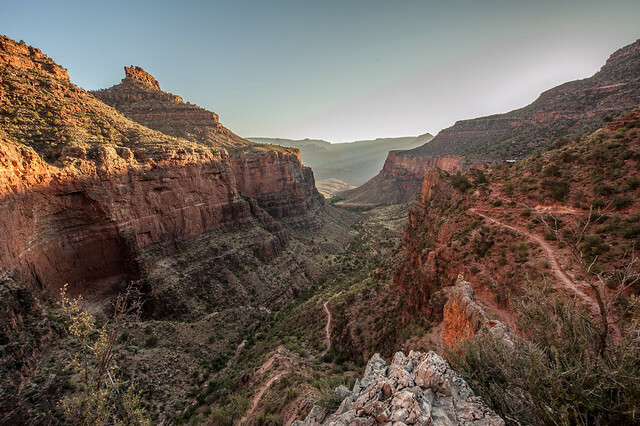 A good look at the winding paths of the Bright Angel Trail. The sun finally rose above the eastern wall of the canyon, good thing my hike was coming to an end because it was about to get very hot. 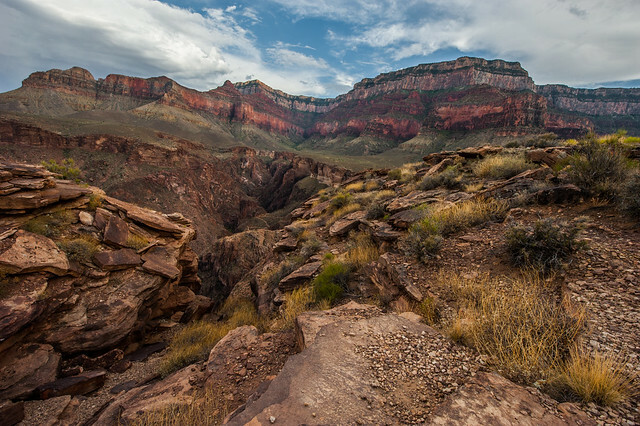 Taking a break from the hike to enjoy the amazing views is a must particularly as you approach the rim. In the end, I’m happy to report back that I made it all the way back out of the canyon under my own power, no embarrassing airlift rescue required. In fact, I flew up the trail eager to prove to myself that I could. I made about a half dozen stops for photos, to fill up water, and to enjoy the last views of the canyon. A celebration was in order after I safely made it back to the trailhead. I spent more time planning for my trip to the Grand Canyon than I’d care to admit. 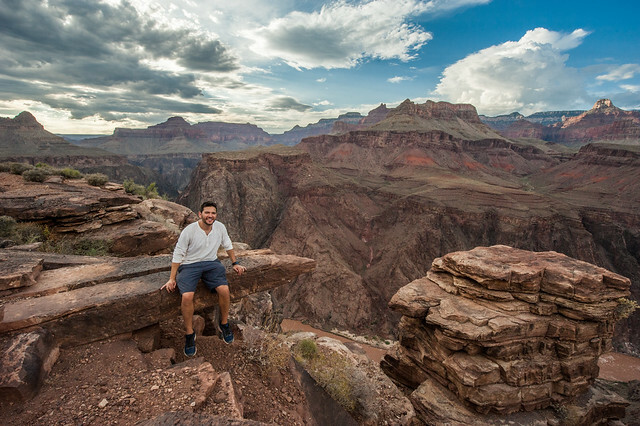 That being said, hiking the Grand Canyon was an amazing experience for me and I attribute a great portion of my success to the research that I put in. 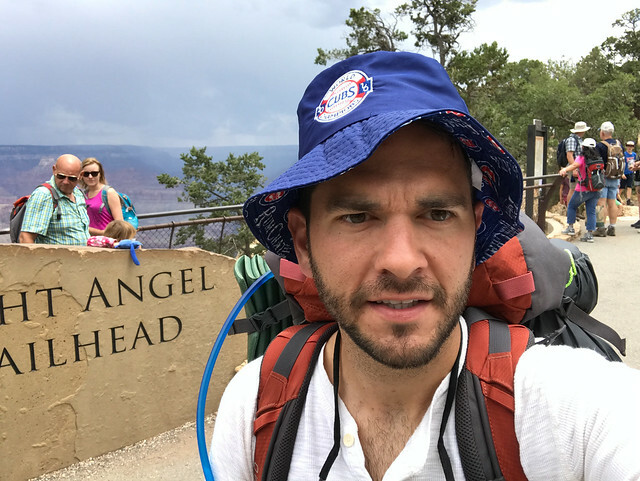 While there are some very real risks in hiking the Grand Canyon, particularly in the summer, I would encourage anyone considering the adventure to go for it. 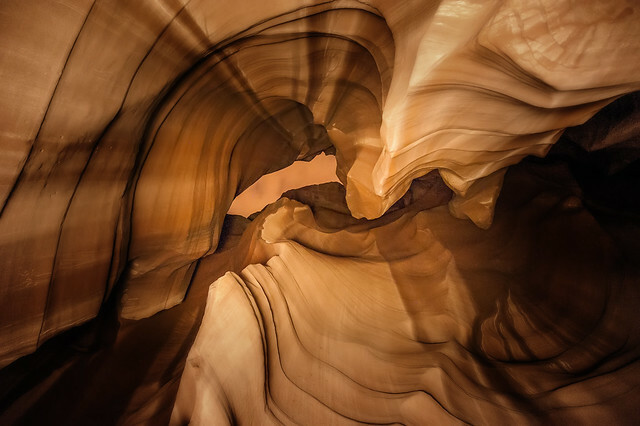 The descent into the canyon requires physical, mental, and emotional fortitude, but as you lower into the canyon there is a feeling of separation from the outside world created by the inaccessibility of the terrain. 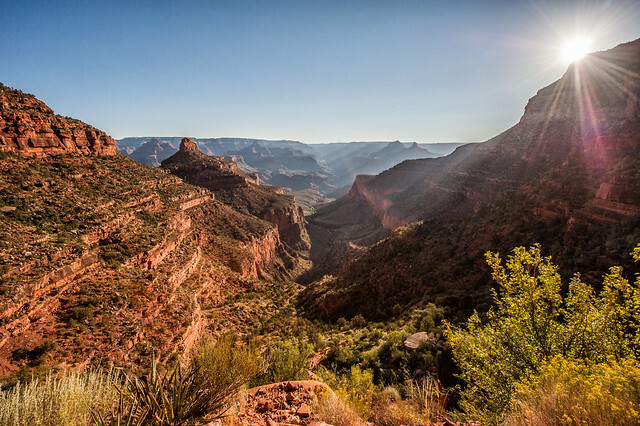 Much like a runner’s high, as I descended into the canyon I felt a buzz of euphoria and lessened anxiety. I did my best to capture as many angles of the Grand Canyon in my photographs as possible, but it is a destination that can’t be enjoyed from a computer screen, and you truly need to observe it in person to appreciate the vastness and depth of the landscape. 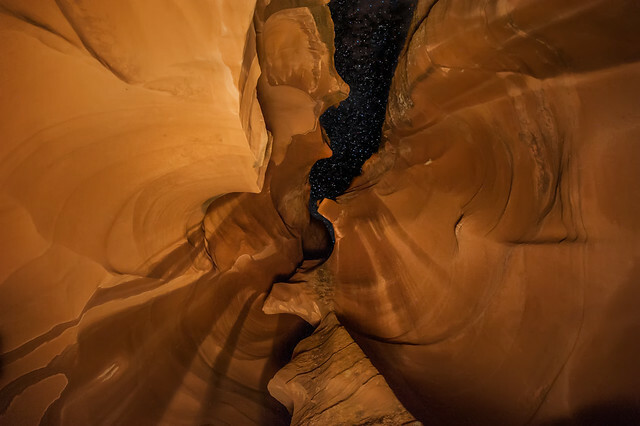 I just returned from a long-weekend photography trip to Arizona. 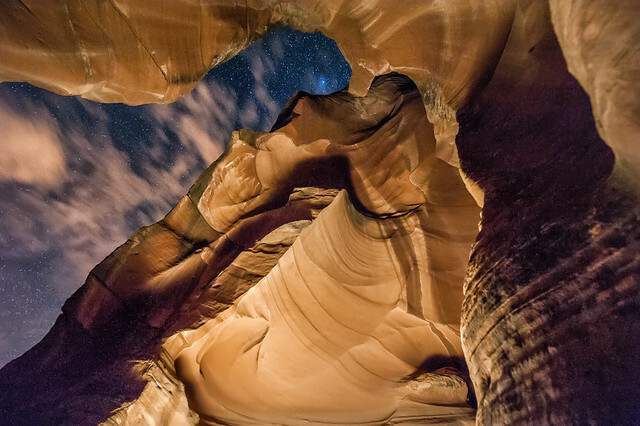 The trip included stops in Sedona, Grand Canyon, Page, along with Flagstaff, where today's photo was taken. I am beyond excited to share the photos that I brought back from this trip in the coming weeks, stay tuned. 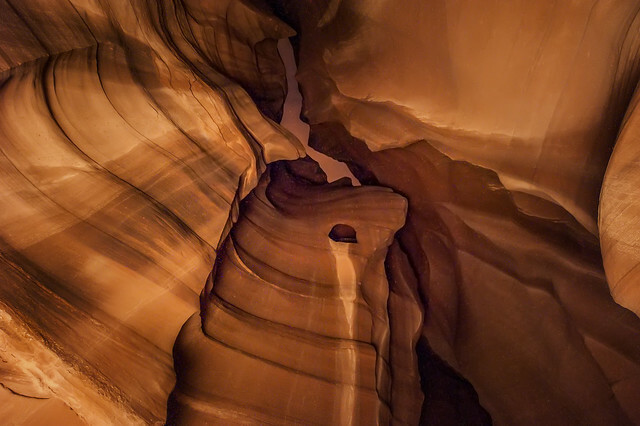 One of many pictures that I can't wait to share from a recent photography trip to Arizona. 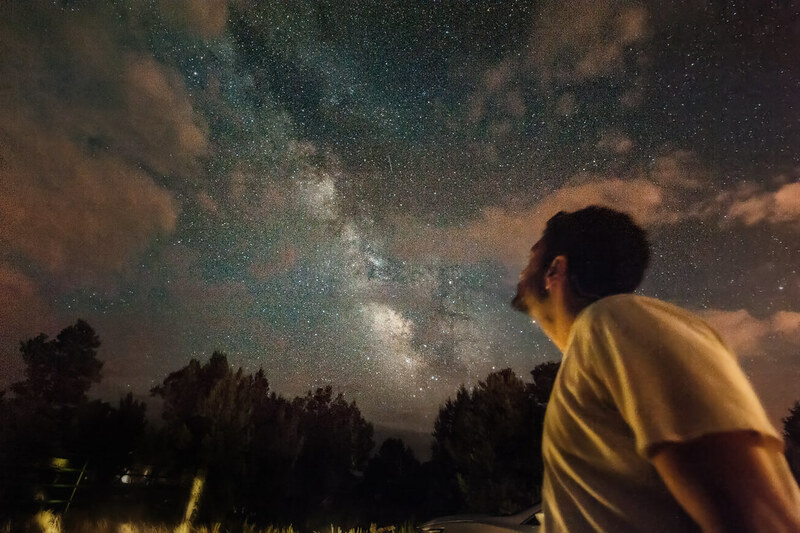 This shot of me admiring the Milky Way was taken in Flagstaff. 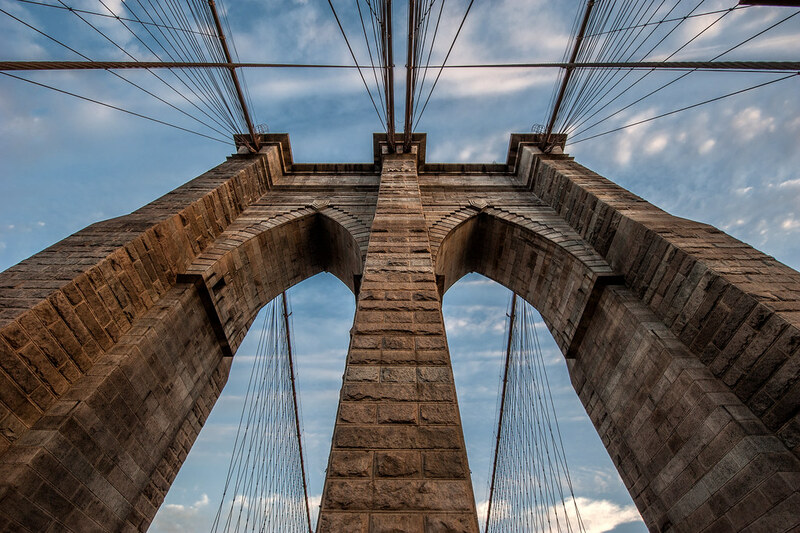 Today's shot is one of the two Brooklyn Bridge towers. This shot was taken from almost directly underneath the tower and was particularly difficult to compose because I had to get the symmetry just right and at the same time make sure I was out of the way of runners, cyclists and other pedestrians using the bridge. Looking up at one of the towers that makes up the Brooklyn Bridge. 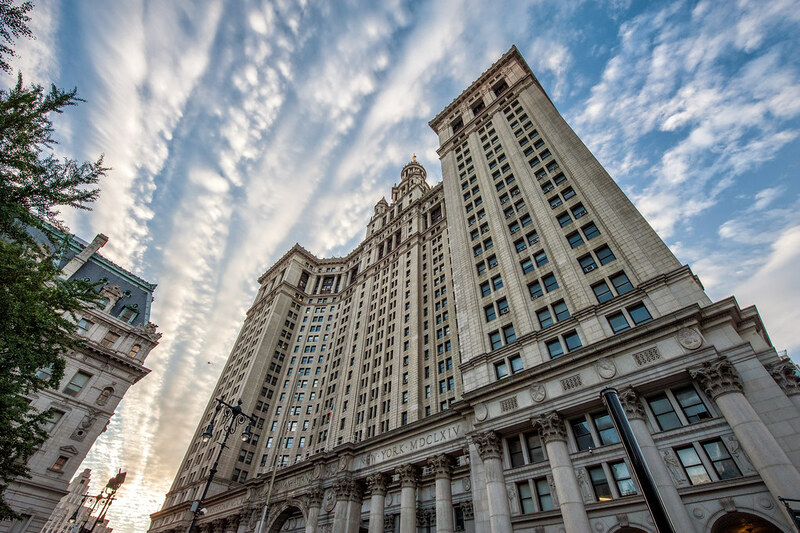 This is the Manhattan Municipal Building near city hall and taken after crossing the Brooklyn Bridge from the Brooklyn side into Manhattan. The Manhattan Municipal Building in downtown New York City. While I've posted several photos of the Brooklyn Bridge, up until this point none of them were taken while standing on the bridge itself. After finding a nice window where no runners or bikers were coming through, I set up my tripod and quickly grabbed this photo on the bridge. I'll have to go for a run here on my next trip to New York. 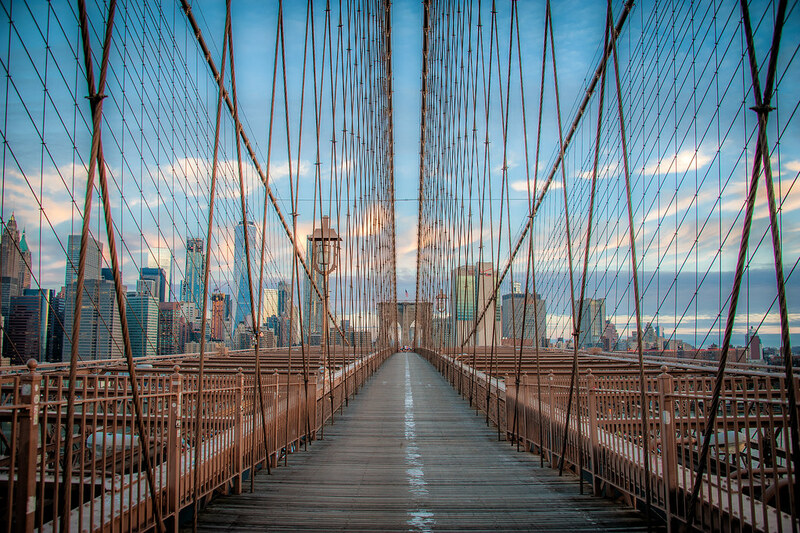 This is the walking/running/biking trail across the Brooklyn Bridge. 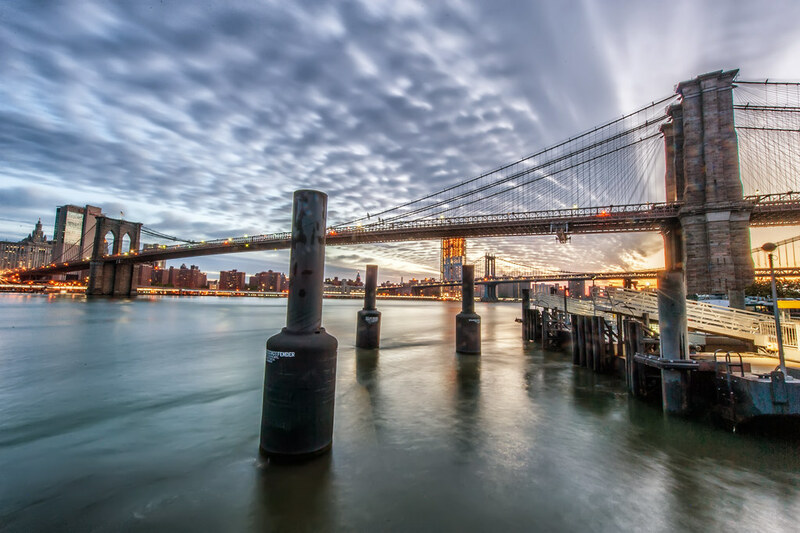 Today's post is another from the Brooklyn Bridge Park area during a recent sunrise viewing. You can see the sun just starting to come above the horizon here. 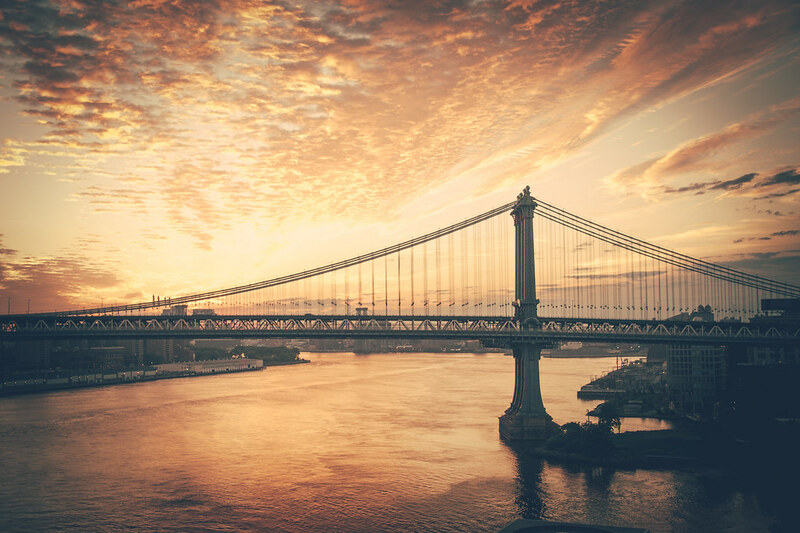 The sun breaking the horizon at Brooklyn Bridge Park in New York City.